You can track the progress of your trees over time as you and others submit photos of them. 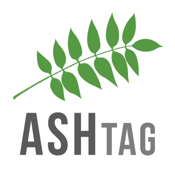 You can also use the live map of all tagged trees to go 'AshTag hunting', and see how many tagged trees you can find and photograph. The photo gallery that users will create for each tagged ash tree will help scientists to identify how the disease progresses and, crucially, the characteristics of trees which don't get the disease and appear to have some tolerance to the disease.